We’re back from a little vacation to Fort Worth and Chicago — odd combination of destinations which involved picking Fuzz up from camp at TCU, then heading on to Chicago for some family fun. We walked all over the place, tried some new restaurants and saw a show at the Second City. It was a nice getaway, but it’s good to be back in the kitchen making my own treats instead of just admiring everyone else’s. Speaking of which, we never made it to Molly’s Cupcakes, which is a place a lot of people have recommended. One of these days we’ll go, but for now here is my cupcake which are actually Mini Key Lime Flavored Cheesecakes. Because this is cheesecake and not actual Key lime pie, it’s not as tart. If you really love tartness and lime, I suggest doubling the lime zest or sneaking in a little lime oil or extract. Speaking of which, has anyone ever used Silver Cloud Estate extract? I have a bottle of their Key lime extract in the pantry which I completely forgot about. Next time I’ll add a dash to these cheesecakes. Either way, there will be a next time. 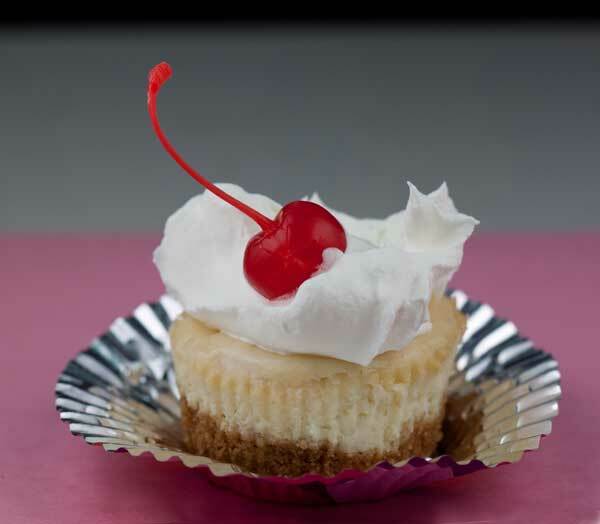 The cheesecakes tasted great and are so easy to share. Once they’re fully chilled, you can put them in a freezer bag and keep frozen until you’re ready to serve them or carry them along to an event. Don’t forget the whipped cream! 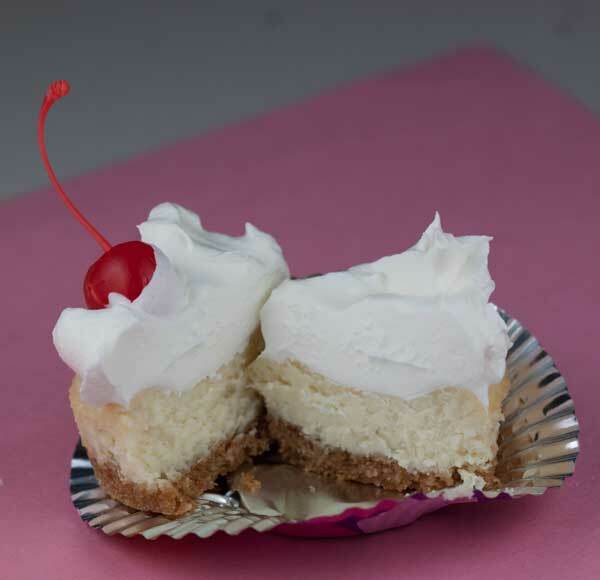 Mini Key lime flavored cheesecakes topped with whipped cream and a cherry. Preheat oven to 350 degrees. Line 12 cupcake cups with paper liners. Mix together crumbs, sugar and butter and divide evenly among cupcake liners. Press down to form crusts. Prepare Filling: Beat the cream cheese, condensed milk and sugar until smooth. Beat in lime zest, lime juice and vanilla. Stir in the egg. When egg is fully blended, stir in the flour. Divide the batter evenly among the mini pie crusts and bake for 25 minutes or until the cakes appear set (if they crack, it’s okay). Let cool at room temperature, then chill for several hours or until very cold. Top with whipped cream and a stemmed cherry or slice of lime. For extra lime flavor, add about 1/4 teaspoon of Key lime extract or a tiny bit of lime oil. Those look delish. It must be mini cheesecake season, because I just did the same thing. So yummy!